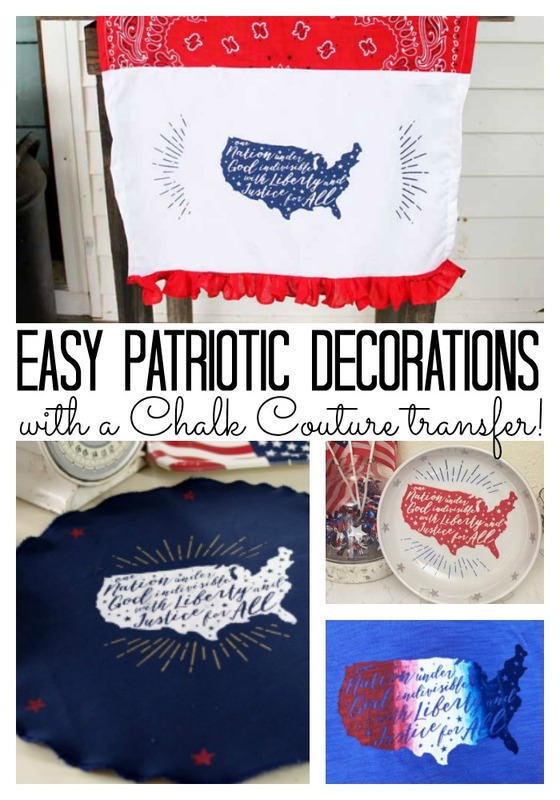 Get patriotic this summer by creating some Fourth of July decorations with Chalk Couture. 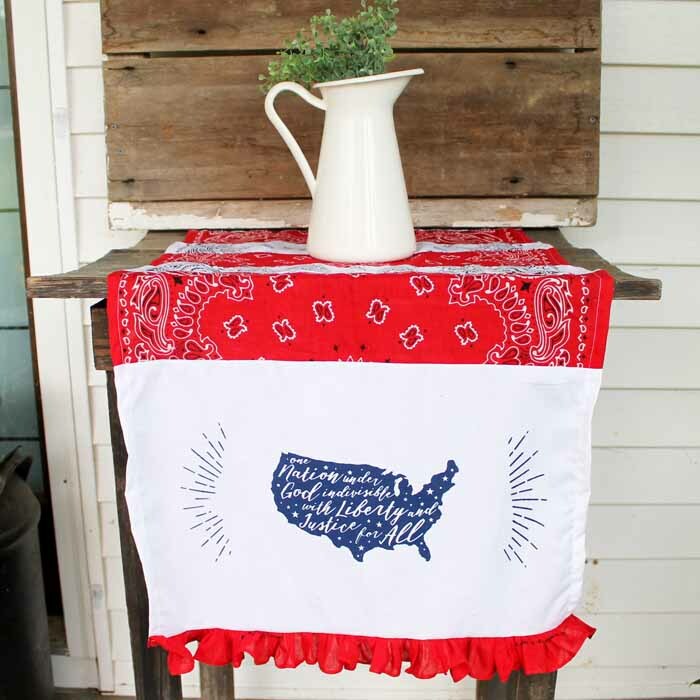 I am going to share how to make this great patriotic table runner then, at the bottom of this post, I will have some other great ideas for you! They all use the same transfer which is the beauty of Chalk Couture. You can use that same transfer over and over again once you purchase it to make a wide variety of projects. Some links below may be affiliate links which means that you do not pay anymore, however, a portion of your purchase will go to support this site. You will also find links to my Chalk Couture store where I am an independent designer. First you need to use Chalk Couture to make the blue and white portion of this table runner. You can watch the video below for full instructions on how to do that. You can also click here to learn more about Chalk Couture and download our beginner’s guide. If you are a beginner with this product, be sure to click here to download our beginner’s guide. 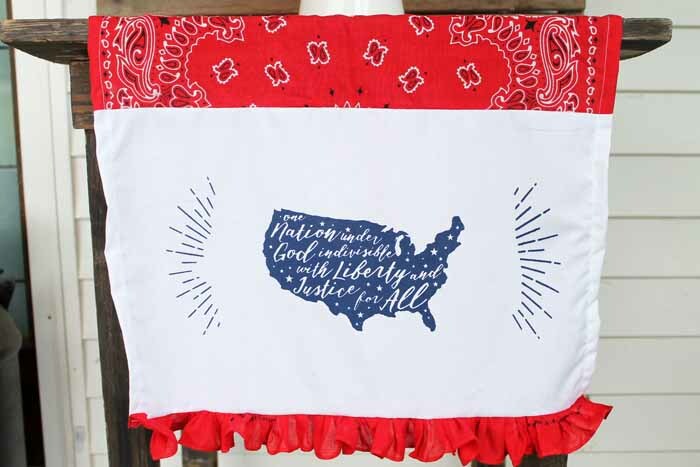 Now that you have your liberty piece complete, you are ready to turn it into a table runner. 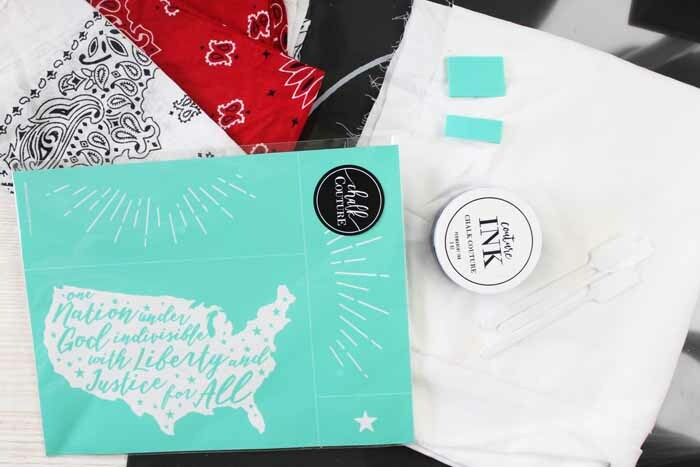 Don’t forget to heat set your ink prior to assembly of your Fourth of July decorations. You can than start cutting your bandanas into strips. I made mine 5 inches wide but that is completely up to you. I also cut off the ends where there is no pattern before cutting into strips. Again that is up to you as this is your table runner! 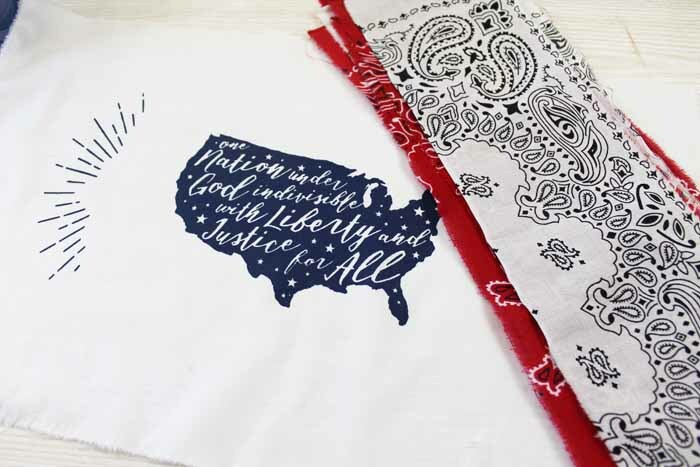 Then just sew the bandana pieces together as shown and add the liberty piece to one end. You can also make two of the liberty pieces and sew to both ends if both will be visible on your table. Fold the sides under and sew all the way down both sides. Then use scrap pieces of the bandana to add a ruffle to the end if desired. 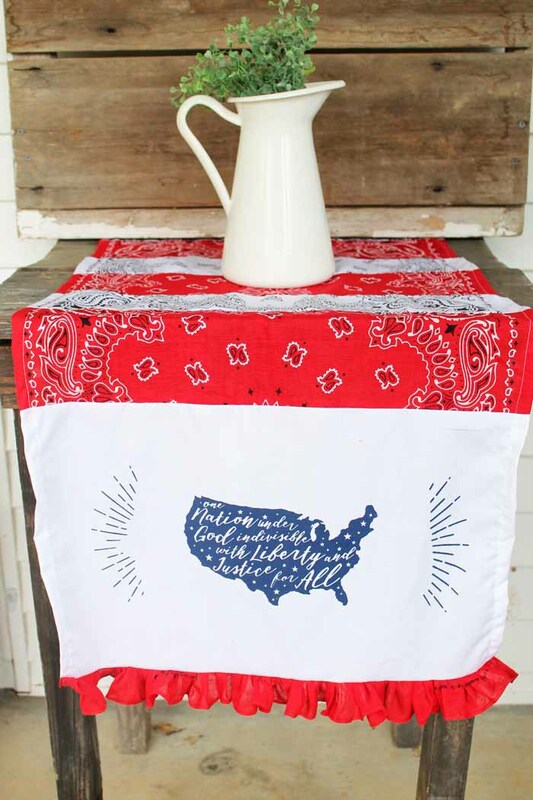 Then just add your patriotic table runner to any room in your home. I love adding a few Americana touches to my home during the summer. 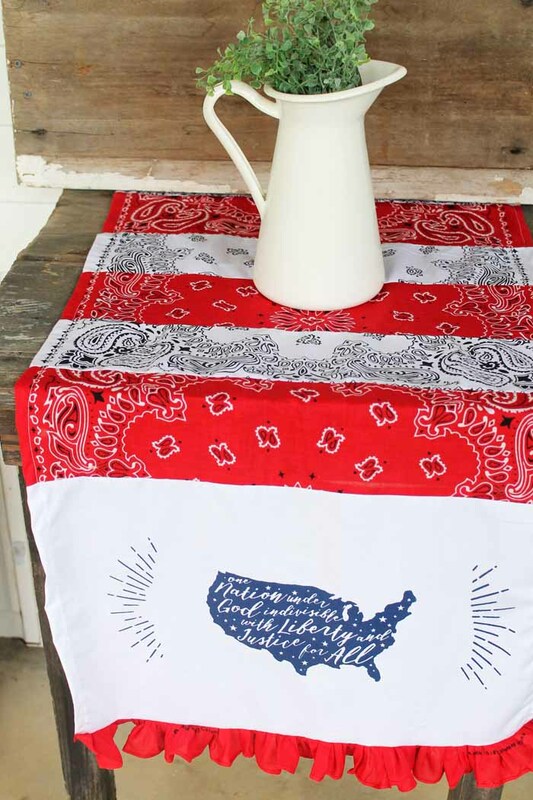 Bandanas are my favorite, inexpensive way to add a touch of patriotic to my Fourth of July decorations. In fact, you can click here to see a banner I made out of them as well. For me, that ruffle on the end is the icing on the cake! 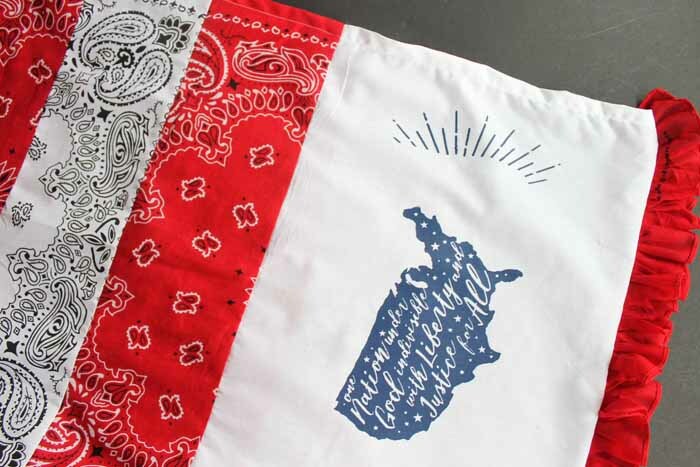 Use the bandana edges on it as they are finished. Then you can just gather and sew to one end! The beauty of Chalk Couture is that you can use these transfers over and over again. 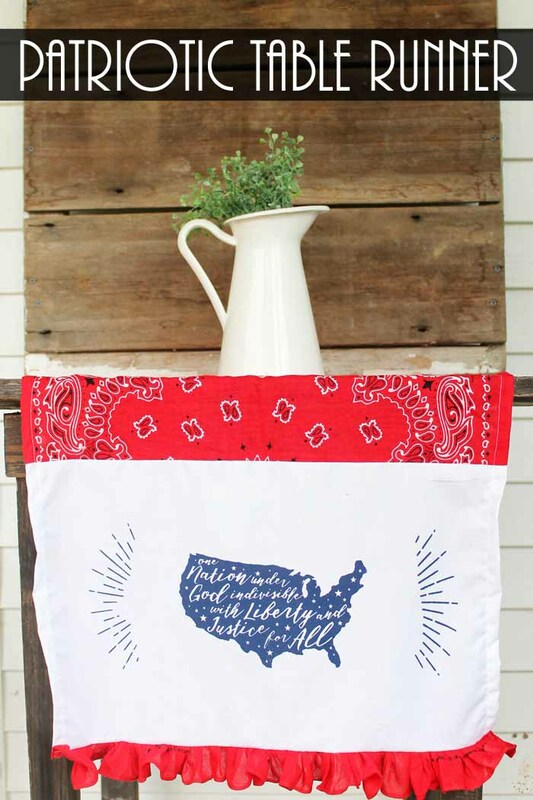 So make a few patriotic table runners and give some as gifts! You can also use this same transfer to make all of the Fourth of July decorations below! Y’all enjoy cause I know once you try Chalk Couture, you will be hooked! Getting started with Chalk Couture? Sign up for our email list and then use our handy free printable guide to start creating chalkboard art in minutes! Check your email to download and print your guide!